A couple of articles ago, I wrote an article on one of the best cornerbacks in the New Orleans area in St. Augustine CB Jeremiah West according to Lee Brecheen. Today, I am writing an article on the other great cornerback in the New Orleans area McDonogh 35’s Kevin Berthey who Louisiana Football Magazine’s Lee Brecheen thinks is just as good as Jeremiah West. Both guys have a lot of similarities. They are both big, physical corners but both of them play for a contender high school. St. Augustine has the makes of a team that can make a playoff run and McDonogh 35 is coming off a semifinal finish in the playoffs. Both guys also play in the best district in their classification. For McDonogh 35, the team plays 4-A powerhouses like Warren Easton and Edna Karr while St. Augustine plays 5-A powerhouses like Archbishop Rummel, Jesuit, Brother Martin, John Curtis, etc. Like West, Berthey has gotten a lot of offers from schools. Berthey has SEC ability to make plays and become a shutdown cornerback. Berhey also plays some of the state’s best players which will help him next year. He also has the speed to not only play at cornerback but also as a return specialist and maybe some on offense. That’s the kind of player he is. Berthey can run a 4.40/40 and that makes him one of the best players in the state. Even though he has all the intangibles, the athletic ability, and many offers already, Brecheen thinks that Berthey is still underrated nationally and that some of the big schools like LSU and others should offer him. “Kevin Berthey is a very gifted cornerback,” Brecheen said. “He is a legit 6’0-6’1 at 180 lbs. and can fly. Berthey is a big time player and is very underrated not only in this state but in the country. McDonogh 35’s Kevin Berthey is the star defensive back of a loaded secondary that also returns star defensive back Brad Stewart for the Roneagles but the team lost a lot of players on the defensive front losing Sci Martin (LSU) and Stephon Taylor (South Carolina). Now, the defense must rely on the experienced secondary which loses only one key player from last year and that is safety Clifford Chattman (Texas A&M). This secondary might be one of the best in the whole state and can be the key factor in bringing McDonogh 35 a state championship. Read more about the star defensive back for the Roneagles as he talks about last season, this year, his thoughts on the rest of the secondary, what makes him unique, and so much more in today’s interview! Kevin Berthey throws up the X for X-Factor and that is what Berthey is for the Roneagles. Kevin Berthey doing what he does best and that is having fun when he plays the game of football. LAFM: What were your stats and accomplishments last year? I ended the season with 4 interceptions, 1 TD, 17 tackles, 1 fumble recovery, & 23 PBUs. LAFM: Do you have any offers from any colleges? If so, what are they? Yes. 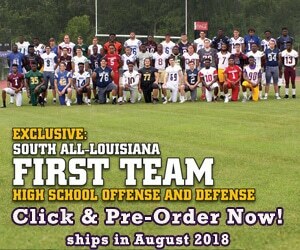 Mississippi State, Troy, McNeese, Ball State, Southeastern Missouri, Prairie View A&M University, Jackson State University, & Louisiana College. The recruiting process has been a wonderful experience. I appreciate all of the schools who offered me. I see all of my scholarships as opportunities to be a great cornerback, so I am very grateful for those schools who offered me. LAFM: What is some advice that you would give to your younger teammates about the process? I would tell the younger guys to just enjoy the ride. Don’t try to get too serious early in the process because you don’t wanna make the wrong school choice, and that decision end up affecting your future as far as a career. So just make sure you handle your business on the field and in the class because the classroom plays a big role in the recruiting process too so don’t think you can get away with just playing football, it don’t work like that. Also, be patient and don’t rush. You’ll know what school would be the best fit for you. LAFM: Last year, the team went 11-3 and went all the way to the semi finals but lost to district rival Warren Easton is the semis by one point. How frustrating was it to lose that game by only one point? It really struck a nerve. Just the feeling of being so close to a win is just train wrecking. LAFM: What does the team need to do better in order to have an even better season? I feel as though we need to work on our communication more in order to be a better team than we were last year. You know, we would get a play call & we would do our assignments and it would work but I think if we could talk and communicate during the play then, that’ll be absolutely great. LAFM: The team returns 16 starters but lost 6 really good starters including 3 on defense. What was it like as a cornerback to have Stephon Taylor and Sci Martin rush the quarterback? I have to say, with those guys I had a few laid back games. They were a big help to our defense and as a cornerback, I don’t want to cover a man for a whole minute but however, if I have to then I will but I had fun playing with those guys & I wish them nothing but the best towards the rest of their football careers. LAFM: Even though the team lost Clifford Chattman, the team returns Brad Stewart and other defensive backs. Where would you rank the secondary for McDonogh 35 as one of the best in the state? I would consider our secondary as the best in the state. I can’t praise that enough. That’s how strong my confidence is in our DBs. My goals are to simply be better than last year. I plan on doubling my interceptions and being able able to mobilize at different positions like free and strong safety. LAFM: What are your strengths as a cornerback? I think my strengths as a cornerback are my length and the way that I can predict a route. I see the route coming at me as soon as the receiver releases. I think that I should improve at my speed. LAFM: Which college or NFL defensive back do you compare yourself to and why? I would compare myself to William Jackson III (former cornerback for the University of Houston and 1st round draft pick for the Cincinnati Bengals) because he has good height and length. He stays low and smooth in his back pedal and he has great make up speed when there’s separation between him and the receiver. LAFM: You play in one of the best districts in the state. What is it like playing state championship teams like Warren Easton and Edna Karr. Does the team prepare for those games more than other games? We prepare for those games like any other games. We do not take it easy on our opponents. It doesn’t matter who we are playing at what time, we come out with a winning mentality. LAFM: What do you like to do when football season is over? I like to stay active. I do activities like swimming and I go play tennis. I really enjoy tennis. LAFM: Who are some people that you need to thank for putting you in the position that you are at today? I highly appreciate my whole family for the support. I had a lot of distractions in my past and I am very blessed and thankful for them not giving up on me and giving me that extra push that I need. LAFM: Is there anybody in your family that has played high school, college, or even the NFL? If so, who are they and where did they play? No. I am actually the first in my family to play football. LAFM: Lee Brecheen thinks that you are the best cornerback in the New Orleans area along with Jeremiah West from St. Augustine. What makes you special as a defensive back in your own words? I feel as though I am very coachable and versatile. I think I bring a lot of swag to the secondary for the defense. I am capable of playing any position coach put me at. From QB to the D-Line. When I have an assignment to do, I give my absolute all.